Suspended ageless between neo-traditionalism and the iconoclasm of free jazz, trumpeter John McNeil and alto saxophonist Jeremy Udden continue adventures in the Shangri-La of their pianoless quartet. 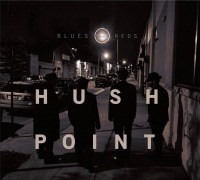 Blues And Reds picks up more or less where the first Hush Point album left off in 2013, but with even more attention to sound dynamics, and with deepened symbiosis between the horns. Replacing Vinnie Sperrazza, drummer Anthony Pinciotti brings his own brand of intensity. Four of the pieces are by McNeil, five by Udden, one by bassist Aryeh Kobrinsky. Because of the spare instrumentation, listeners may at times remember Gerry Mulligan, Jimmy Giuffre or Ornette Coleman. The music manages to be at once stimulating and relaxing. With its whimsy and precision, Kobrinsky’s title tune is, for lack of a better term, a hoot.